Already on Android for the past few months, this conceptually simple calculator app is finally available to iOS users. What may seem basic in theory becomes extraordinary in MyScript's execution, leaving you with a buttonless calculator you'd never think to want but can't imagine living without. Though a minor annoyance, using a calculator for anything more than basic arithmetic almost invariably ends in a frustrated hunt for those rarely used symbols. 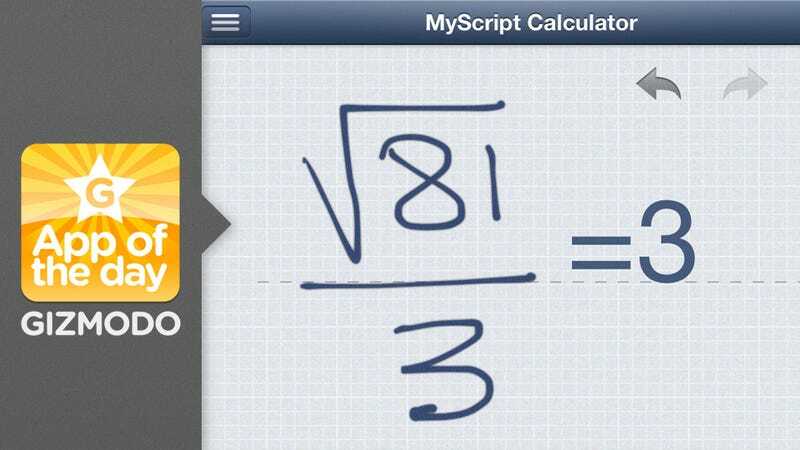 MyScript lets you drop the witch hunt and jot down entire equations with your finger in a way that's undoubtedly quicker and feels far more natural. Handwriting recognition apps don't necessarily have the best track record, but even with demonstrably terrible handwriting, this one was able to pick up every stroke without a problem. While this certainly isn't just for students, it's nice to know that the app supports a wide enough range of functions to be useful for virtually any grade level. MyScript is just as effective at handling basic arithmetic as it with percentages, roots, negative numbers, and exponents. You can even effortlessly work trigonometry, logarithms, and constants, should the mood strike. The app does have its limits: no graphing function. But for the casual mathematician, this is more than enough to get by.